With most amateur hockey seasons completed, ISS Hockey has released its final prospect rankings in the 2018 NHL Draft Guide. 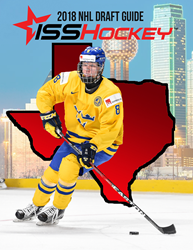 ISS Hockey announces the release of its final player rankings for the upcoming NHL Draft to be held on June 22-23, 2018 in Dallas, TX. The rankings are featured in the newly released 2018 NHL Draft Guide. All proceeds from the 2018 NHL Draft Guide will benefit Hockey Helps the Homeless, an organization that ISS Hockey parent company HockeyTech has adopted as its company charity. The hockey media also relies upon the ISS Hockey rankings in their coverage of draft prospects. ISS scouts are relied upon by the hockey media as expert guests leading up to the NHL Draft.